Magma Fincorp NCD, Issue 2019, Features, Credit Rating, Reasons to Invest, Price, Date, Allotment, Listing, Reviews, Status & How to Apply? Magma Fincorp Limited is a Kolkata based non-financial company which is registered with the reserve bank of India. The company operates more than 306 branches in 22 states and union territory. Mfls’s clients include of first time buyers, self-employed and nonprofessional individual small and medium entrepreneurs and customers with informal income and limited banking and credit history. There is a cascade of NCD in March and April. There are more than 5 companies aligned for nonconvertible debentures in April 2019 to pull thousands of crores. Magma is all set to issue non secured debentures. The return is as high as 10.75% per annum and attracting investors now. The investors are in a dilemma whether or not should they consider investing in Magma Fincorp NCD. If you are keen to fetch details regarding the Magma Fincorp limited NCD Issue details then I would say you are at the right place. So, without any further adieu let’s get started! Why invest in Magma Fincorp NCD? How to Apply Magma Fincorp NCD Issue of 2019? How Magma Fincorp April 2019 NCD interest is taxed? Should you invest in Magma Fincorp NCD of April 2019 – Tranche-I? The Magma Fincorp limited incorporated in the year 1978, was a non-banking financing company. Later in the year 1989, it started providing financial services as well. The company registered as the systematically important non depositing accepting nonbanking financial company with the reserve bank of India under Section 45-IA of the Reserve Bank of India Act, 1934. 1) Its revenues are at Rs 2,026 Crores in FY2017 to Rs 2,037 Crores in FY2018. 2) Its profits are at Rs 6.09 Crores in FY2017 to Rs 202.4 Crores in FY2018. What is the competitive strength of the company? It is issuing secured NCDs which are safe to invest compared to other unsecured NCDs. Good credit rating from BWR Ratings and Acuite Ratings as AA/Stable. Why invest in Magma Fincorp Ltd NCD? For the purpose of onward lending, financing and for repayment/prepayment of interest and principal of the existing borrowings of the company. Why not invest in Magma Fincorp April 2019 Tranche-I NCD? In an event in the future regarding the underperformance of the company or for some reasons profits are reduced, there could be a delay in the interest payment or repayment of capital of NCD. It is advised that one should invest in a company which is growing and making consistent profits. as an NBFC, any dissent with the reserve bank of India’s observation made during it periodic inspection could expose them to penalties and restrictions. Any negative developments in the asset-backed financing industry could adversely affect their business and results of operations. Their business operation consists of dealing with high-risk borrowers. Any delinquency on the part of customers could negative hamper their business, result of an operation and financial condition. The company’s inability to restore the full value of collateral or amounts outstanding under defaulted loans in a timely manner or at all could adversely affect their results of operations. One of the prime concern of the investors is how to apply for Magma Fincorp NCD issue of 2019. You can apply to these NCD is a demat form only. If you have a demat account, you can log in to your account and go to IPO/NFO/NCD section and apply for the same. The process of applying NCD would be through ABSA (Your amount would be blocked initially and upon allotment, your amount would be deducted and NCD unit allotment would be done, else your amount would be unblocked) You can reach out to any of the lead managers. Since you need to apply through the demat form only, there would not be any tax on interest received through these NCD’s. It is irrelevant whether the company would deduct TDS or not, one has to state the interest in their income tax return and pay income tax based on the individual tax bracket. When this Magma Fincorp NCD of 2019 would get listed on BSE/NSE? These Magma Fincorp NCD would get listed after 6 working days from the date of closure. If NCD closed as per the closure date i.e. 8th May 2019, it would get listed after 6 working days i.e. 17th May 2019. If it is subscribed earlier and subscription closes, it would get listed after 6 days from such early closure date. Though Magma Fincorp limited is coming with unsecured NCD, we are seeing that nonbanking finance company are delaying the interest payment due to the liquidity crunch in the company. This NCD is for 3 years, 5 years and 10-year duration. Do you feel safe to park your money in such high-risk nonconvertible debentures for such a long duration? 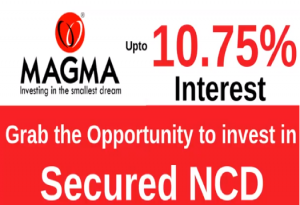 Magma Fincorp NCD offers to yield up to 10.75% interest per annum, however, is high risk. The higher the risk, the greater the return. If you are someone with high-risk appetite and are willing to pool your money in such nonconvertible debentures even after the financial crunch and scams. You can consider investing in these NCDs for 3 years or a maximum of 5 years tenure. Do you find these “Magma Fincorp NCD” worth investing? If you find the information relatable you can share it among others via Facebook and Twitter. Also, if you have queries regarding the post then you can seek our assistance. You can connect with us through the comment section below. All your queries and doubts will be sorted with ease. We at investor academy consist of a team of quality professionals who aims at delivering quality and useful information.